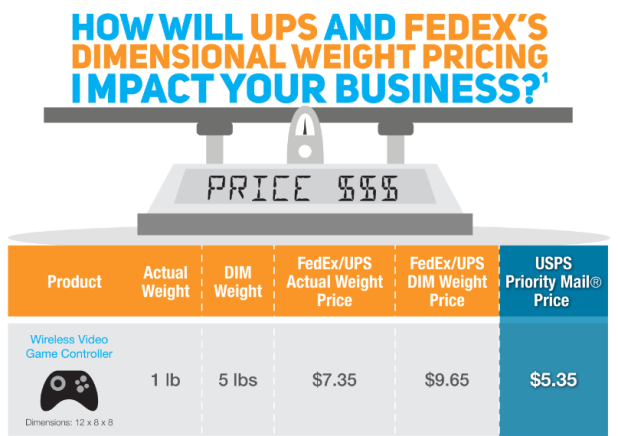 By now, most businesses have heard of the upcoming UPS and FedEx dimensional weight pricing, which will impact all Ground shipments, beginning on December 29, 2014 and January 1, 2015, respectively. When dimensional weight pricing goes into effect, shipping costs for these carriers will be charged based on the volume of a package in relation to its weight. This means that the cost for shipping large, lightweight products – like a purse or a backpack – will be significantly higher in 2015 than it is today. Multiply the length, width and height of your package and divide it by 166 (the standard dimensional factor used by FedEx and UPS for domestic Ground shipments). Round this number up — this is your dimensional weight. Compare the dimensional weight to the actual weight of the package. Whichever of the two “weights” is higher is used to determine the shipping cost for the package. If you discover that your ecommerce business will be impacted – it’s not too late. You still have time to consider other shipping options, such as USPS Priority Mail. The Postal Service recently introduced lower rates for Priority Mail in September, making it an affordable shipping option for packages weighing between 1 and 40 pounds, and an excellent alternative to FedEx and UPS Ground services. In addition, USPS Priority Mail is faster than FedEx and UPS Ground, taking on average two days to deliver a package coast-to-coast, instead of five to six days. Since the USPS is not planning any price increase in January, you can enjoy these new Priority Mail rates well into the New Year. Take a look at how USPS shipping rates compare to FedEx and UPS dimensional weight pricing in the chart below.